Pricing includes the mug & digital print one position. Price is for Calypso Photo Mugs. 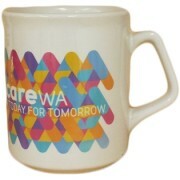 Utilising the white coloured version of our Calypso mug, you can turn your photo mug into a promotional product to be cherished. 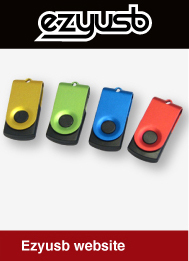 The solid white background means your photos and logos will stand out and be noticed by all of those using them. 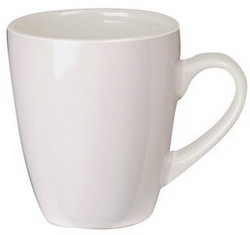 Wondering what a sublimation mug is? 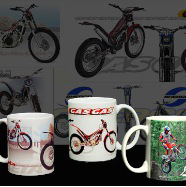 Sublimation is a digital print method which provides a photo finish to your promotional mug. Photo mugs that have been produced using the sublimation method allow for text and images to be used, for gradient to be added and provide a different overall look to the end product. While many people use photo mugs as a promotional gift between businesses, these mugs could also be used for sporting clubs for end of year presentation gifts or personalised thank you gifts to your club sponsors and supporters. 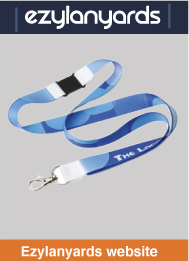 They could even be sold as a merchandise item as a fundraising measure. The Calypso is a large mug, well-made and durable. 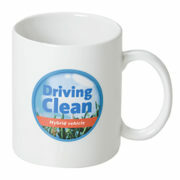 The basic coffee mug style will suit any promotional activity you are planning. If you are using these as a corporate gift or promotional merchandise item and you would like to have them professionally presented, the Calypso Photo mug will fit into our Mug Box 1, which can then be branded using custom logo print stickers.